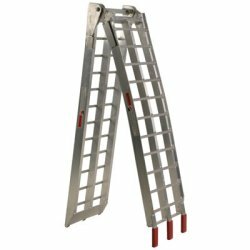 Pair of light weight aluminium folding loading ramps with cut-out grip system. Suitable for motorcycles, ride-on lawn mowers, atv/quad bikes and other wheeled machinery. Slightly curved for improved ground clearance. Dimensions: Length 2260mm, Width 285mm, Weight capacity per pair 540kg.